In this New York Times bestseller, Tina Turner—the long-reigning queen of rock & roll and living legend—sets the record straight about her illustrious career and complicated personal life in this eye-opening and compelling memoir. TINA TURNER READS THE PROLOGUE! From her early years in Nutbush, Tennessee to her rise to fame alongside Ike Turner to her phenomenal success in the 1980s and beyond, Tina candidly examines her personal history, from her darkest hours to her happiest moments and everything in between. My Love Story is an explosive and inspiring story of a woman who dared to break any barriers put in her way. Emphatically showcasing Tina’s signature blend of strength, energy, heart, and soul, this is a gorgeously wrought memoir as enthralling and moving as any of her greatest hits. In this New York Times bestseller, Tina Turner—the long-reigning queen of rock & roll and living legend—sets the record straight about her illustrious career and complicated personal life in this eye-opening and compelling memoir. TINA TURNER READS THE PROLOGUE! Tina Turner, born Anna Mae Bullock, is a singer and actress whose career has spanned more than sixty years. She has won numerous awards, including eight Grammys. 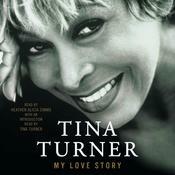 Tina began her music career with her husband Ike Turner as a member of the Ike & Tina Turner Revue. She divorced Ike in 1978 and, after virtually disappearing from the music scene for several years, rebuilt her career, launching a string of hits including her 1984 solo album Private Dancer. One of the world’s most popular entertainers, Tina has sold more concert tickets than any other solo music performer in history.